What Fruit Can a Dog Eat? | I Love My Chi I What Fruit Can a Dog Eat? % What Fruit Can a Dog Eat? 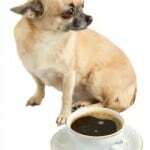 You are here: Home / Chi Health / What Fruit Can a Dog Eat? Did you know June is National Fresh Fruit Month? No matter what month it is, it should be fruit month! 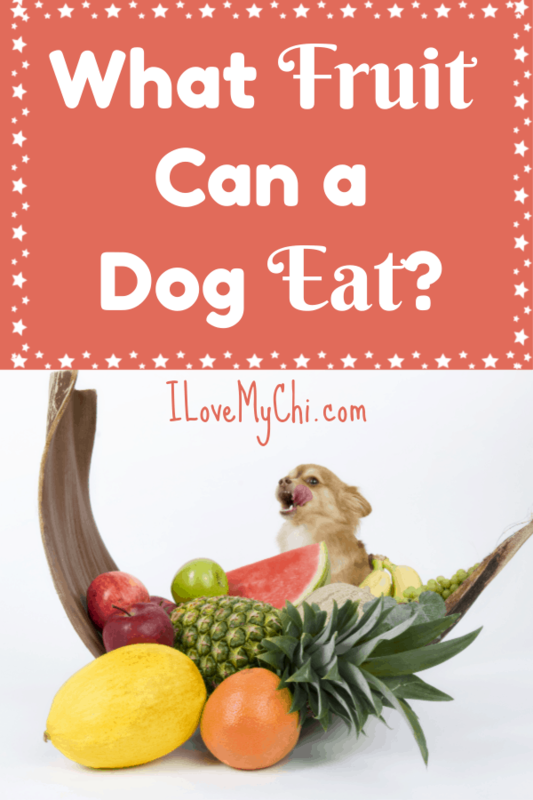 Ever wonder about what fruit can a dog eat? There is nothing I love better than a nice juicy orange or a slice of watermelon. You can also share some fruit with your dog if you’d like. That is, you can share most fruit. 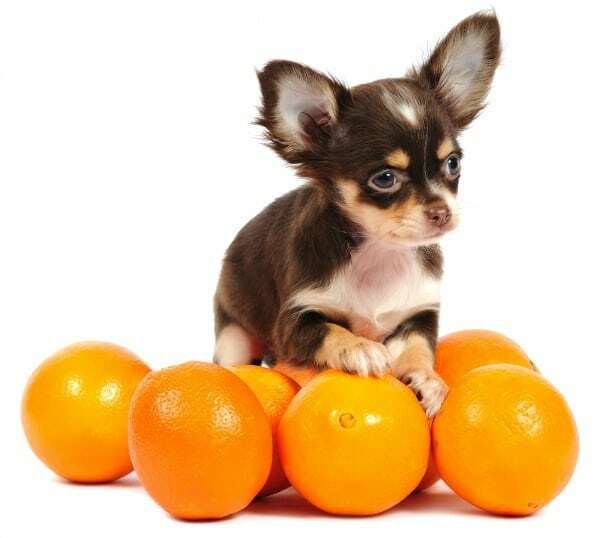 Some fruits are toxic to dogs . Does your dog even like fruit? My terri-poo used to go crazy for oranges. I believe if you put a steak in front of him and also an orange, he would have picked the orange. He loved them that much. My beloved chihuahua Kilo loved fruit when she was alive, particularly apples and watermelon. My chihuahua Lucy loves apples and my yorkie Ziggy loves bananas. My chi-mix Lucas doesn’t seem to care for fruit though. He’s somewhat of a picky eater. The trick with giving fruit to your dogs is to just give them a little bit. A bite or two will do. Fruit has a lot of sugar and even though it’s a natural sugar, it can still add some pounds to your dog, if your dog has a weight problem. A few things to be aware of is do not feed dogs pits and seeds from fruit. Some of them are poisonous and at the very least a choking hazard. 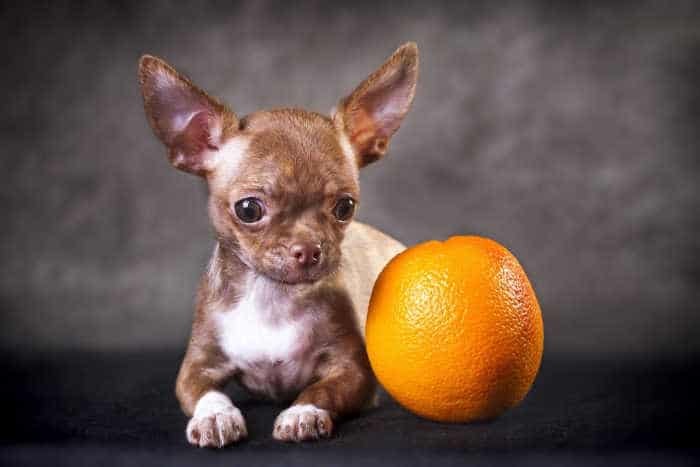 Although you can give the fruit of the orange to your dog, do not let them have any of the peel, leaves or any other part from an orange tree. Anything other than the fruit itself, is dangerous to dogs. Make sure you wash the fruit (just as you would for yourself) before feeding to your dog. 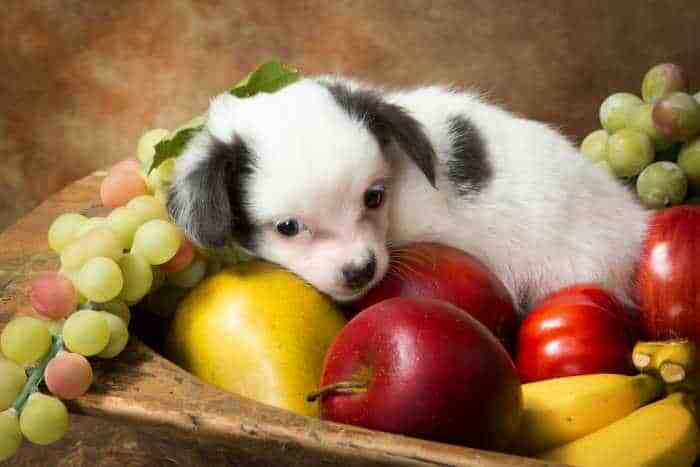 So, does your dog like fruit? What kind? I love the name Paco Bell Sandra! wow thanks Cathy Maddie loves watermelon , also got her the doggles…now she just loves the sun (not too much) thank you so much , keep up the great work !!! You’re welcome Sandy. So glad the doggles are working out for Maddie! They are sunglasses for dogs Norma. My dog Kilo loves banana, watermelon, apples and other melon. What a great photo. Thank Susie. I haven’t tried banana yet with my Kilo. I’ll have to give it a try and see if she likes it. My Bella loves apples and watermelon!!! Yep that seems to be a favorite of a lot of doggies Julie! Yes, carrots are not only good for them, they make great chew toys! I wish my dogs liked carrots. 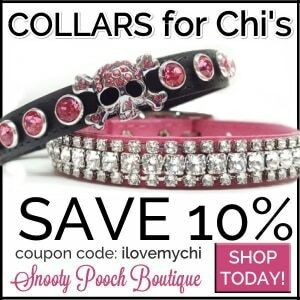 Your chi has good taste. Georgia peaches are so yummy! My Chi’s eat poop so they get pumpkin! LOL! 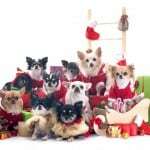 Your fur babies are adorable! I will have to try the other fruits to give them variety. Thank you! Hi, I give my baby alsorts of treats. I get a cheese wrapped in chicken. It quite hard. But I get it for her teeth. 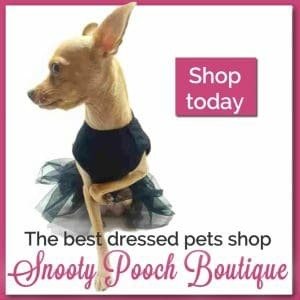 The pet shop has now discontinued it because they said the cheese is NO good for dogs as they become Lactose free once they stop feeding from their mums. Is that true? I have never had a problem giving cheese to my dogs. 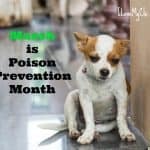 In fact my vet suggested it when I was having trouble getting one of my dog’s to take their pills (he said to wrap the pill in cheese). Some dogs, like some people are lactose intolerant and they shouldn’t have cheese but if your dog isn’t having any issues with it, I wouldn’t stop giving her it. My dog loves eating banana sometimes, but sometimes she is very picky and refuses. I guess it depends on her mood, but I notice after exercise she is more likely to eat it. Interesting that she wants it after exercise. Maybe she needs the minerals in the banana then. I’m grateful whenever she eats fruit and healthy foods. She is a funny dog. 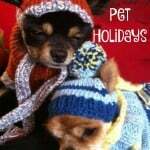 My Double Coated Long Hair Chi runs around me in circles as we walk. Is this normal behavior? He only goes right. He does it in the elevator. If I ask him a question he dances in circles…..
Yeah that’s a chi thing. They love to run around in circles. It’s normal. Both my girls Princess Lily and Duchess Lulu love all fruit. I can’t eat fruit in peace without having to share with them. Watermelon, apples, nectarines, pears, oranges, cuties -mandarins. They really love Cuties. I bite half and give them the rest. They prefer it to be juicy opposed to the whole thing? They do like a lot of fruit! Mine only like one or two things. Watermelon is their new favorite. 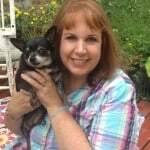 I was sitting on couch eating a plum, when Tink (Chihuahua) jumps in my lap loving me . I offered her a bite, she absolutely loves plum… ate all I gave her. About 6 small pieces. Plums are a great fruit for them,as long as they don’t eat the pits. 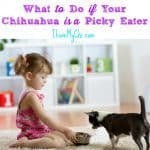 My Lucy always wants to chew up the pits so we have to be really careful not to leave any lying around. Cherries are my favorite too! My 2 chis love yams (canned) in their chicken and rice bowls I make them 2x a day. Yams are great for them too! I concur. They eat this every day and love it. My chi mix Bandit loves pretty much any fruit we give him. We rescued him from our Humane Society, they rescued him from a puppy mill. We believe our other chi is a deer head chi and he is very very picky. He will eat carrots (sometimes) and apples (sometimes). He absolutely refuses bananas but he used to eat them all the time. He is also from our Humane Society. They are as close as brothers although Bandit is very skittish. We have had him for around six years and he is not as skittish as he used to be. O.D. (our deer head) used to bark constantly at my aunt. He does not really like other dogs but will tolerate them if he has to. 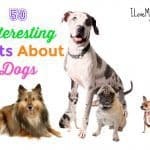 I have been reading these articles recently and they are very helpful! Thank you soo much! You’re welcome Krystal and thanks for telling me about your fur babies!